Dates:768-545 B.C.E., or 791-418 B.C.E. The object is a wooden coffin box (a) associated with an anthropoid coffin lid (37.1521Eb). The coffin bottom is constructed from several pieces of wood that have been mechanically joined together with wooden dowels. There are 8 rectangular holes on the top edge of the coffin box; 4 on either side, indicating where the tenons were used to secure the lid. The circular holes, piercing the walls of these sections, were for the dowels that were used to secure the tenons when the lid was closed. The exterior surface of the coffin box is covered with a plain, open weave fabric, likely linen, followed by a layer of white gesso, polychromy and a streaky, uneven, waxy coating. Visible in some areas below the linen layer is a reddish-brown, clay-like material. It appears that this material was occasionally used to even out the wood surface. The exterior of the coffin box is decorated with vertical hieroglyph inscriptions. The interior of the box appears to have the reddish-brown clay-like material over the wood, then a white gesso layer followed by a paint layer. The surface is matte and does not appear to have a varnish coating. The top edge of the coffin bottom is covered in a matte black resin(?). 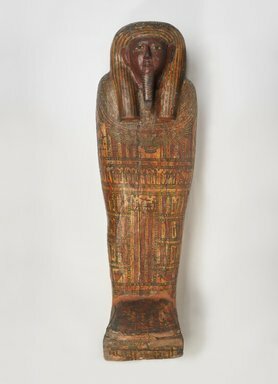 The interior design of the coffin depicts a woman figure (Isis?) with hieroglyphs below. Condition: The coffin box is in poor and unstable condition. There are a number of splits along the original joins of the wood planks. The splits present on the interior of the coffin box exhibit wide gaps where original dowel elements are visible. There is a large chunk of the reddish-brown, clay-like material wedged into one of the splits on the interior bottom of the coffin, which appears to be further opening the wood join and causing more structural instability. There are wood and/or paint/gesso losses along the splits/gaps on both the interior and exterior of the coffin box. The joins of pieces forming the foot end are visible due to loss of the paint/gesso layer. Originating from the wooden dowel elements that secure the sides of the coffin box to the foot are cracks in the top plank of wood on both the proper left and proper right sides. Scattered areas of the wood, particularly at the foot area are lifting, friable and deteriorating. On the exterior of the coffin box, there are areas of polychromed linen which are lifting away from the wood support. Although scattered overall, this is particularly severe on the bottom of the box and in areas associated with the cracks that have occurred as a result of the splitting of the wood joins. There are numerous areas of polychromed linen loss, which additionally have areas of lifting or loose polychromed linen. These areas of loss are scattered throughout, however are primarily on the bottom and along the top exterior edge of the coffin box. On the exterior foot end there are some areas of a grainy, light-grayish-pink material over the white wash. Linen is visible between the horizontal wood join. The interior of the coffin box exhibits areas of loose reddish-brown clay(? ), gesso and paint as well as complete loss of these materials.